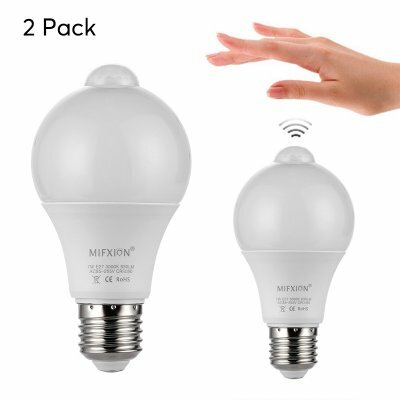 Successfully Added LED Light Bulb Set - Motion Detection, Light Sensor, E27 Plug, 630 Lumen Each, 3000K Bright Light, 270-Degree Light Angle, 7W to your Shopping Cart. These LED light bulbs offer you a convenient way to light up your hall way. Each light comes with an intergraded motion sensor and light sensor. Thanks to this, they will light up automatically whenever movement is detected or the natural light is running low. Therefore, you can always be assured that you and your visitors will be treated to a lit up hall way. This package comes with two LED bulbs that each feature an E27 plug. Thanks to their durable energy efficient design, they bring along a stunning 25.000 hours service life. Therefore, you’ll be able to light up your property for years to come in a cheap and environmentally friendly manner. Each LED light bulb is capable of emitting up to 630 lumens of bright 3000K light. Along with a 270-degree light angle, you can be assured that each bulb lights up its entire surroundings. The motion sensor intergraded within these smart LED lights support a distance of 6 meters. Thanks to this, you’ll always be able to enjoy a lit up path while you’re nearing an empty hall way after dark. Whether you use it at home or in the office, these energy efficient light bulbs offer you the perfect lighting solution. These LED light bulbs come with a 12 months warranty, brought to you by the leader in electronic devices as well as wholesale electronic gadgets..